OXFORD, Miss. 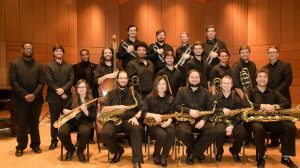 – The University of Mississippi jazz ensemble, The Mississippians, is pursuing a once-in-a-lifetime opportunity. The group is raising funds to embark on a European jazz festival tour in July 2018. Last year, the ensemble was invited to perform at the Notre Dame Collegiate Jazz Festival, which is one of the country’s most prestigious college-level jazz festivals. Now, the group is gearing up to go global. “Our current students are excited for this unique opportunity to experience new cultures and share their music with an international audience,” said Michael Worthy, director of The Mississippians and associate professor of music. Some of the stops on the European tour are the Jazz à Juan Festival in France, the Umbria Jazz Festival in Italy and various concert venues and jazz clubs across the two countries. The Mississippians will be representing not only the university on this international stage, but also the state of Mississippi. Worthy hopes that this experience will be a “formative event” for students going on this tour, both as professional development and life experience. “Performing at an international jazz festival will give our students the opportunity to hear the performances of jazz musicians from around the world, and they will gain insight on how the world has interpreted this American innovation,” Worthy said. The ensemble has created an Ignite Ole Miss campaign to raise money to help fund their travels. Ignite Ole Miss is the university’s crowdfunding platform. To make a gift, visit http://ignite.olemiss.edu/jazz.